Caution: Hot Beverage Check out today’s full comic on Webtoon. Thanks! Too Soon Check out today’s comic on Webtoon. Thanks! Feelings Check out today’s comic on Webtoon. Thanks! Seconds Check out today’s comic on Webtoon. 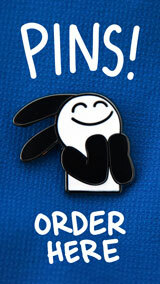 And don’t forget to order a Buni book. They make great gifts. Thanks!